So, I guess that name, Teramont, is just to make it clear you won’t be driving it up Olympus Mons. Design-wise, it seems to be handsome, maybe a little bland, but certainly no more so than the vehicles it’s likely to compete with in that low-$30K range, like the Honda Pilot, Hyundai Santa Fe, and the Ford Explorer. It’s very much the car Volkswagen needs in its lineup right now, especially in the U.S., where the crossover rules all. The Tiguan is too small and the Touareg is too expensive. This will be poised to strike right at the heart of crossover-hungry America. 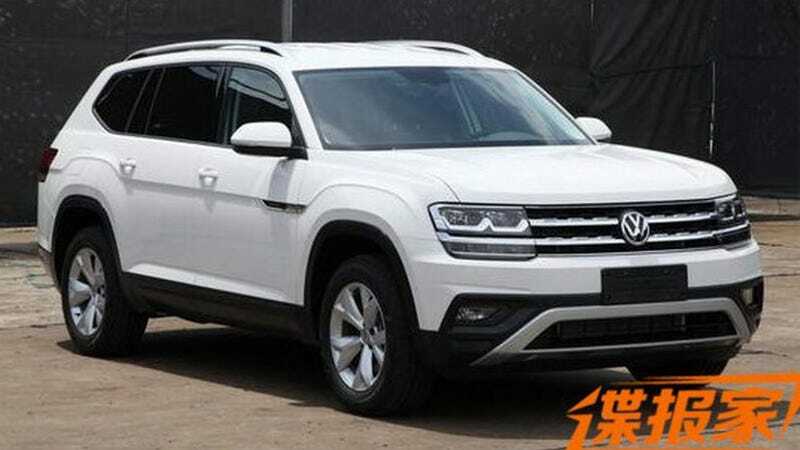 While this looks like a Chinese-spec model, the SUV is expected to be built in Volkswagen’s Tennessee facility, and will be sold in America. The badging seen on this example suggests it has a 2-liter TSI (turbocharged) gasoline engine, but it’s a pretty safe bet other engine options—likely a V6 and a hybrid—will be offered. I like the front-end treatment, and the flat-ish topped wheel arch detailing. Interestingly, it looks a little more sculpted in sheet-metal details from the show car, which is unusual. It’s not clear how similar this is to Skoda’s seven-seat Kodiaq, or if there will be a more upscale Audi variant just yet, but it makes sense that VW would start with a mid-market, high-volume SUV like this.